As forward thinking as it is having a mini-screen on your wrist keeping you up to date, there's still something charmingly traditional about a watch with an actual face. Of course, it wouldn't be a proper smartwatch without a glut of apps and utilities under its strap and that's where Movado is coming in with its Android and iOS-friendly Bold Motion series. At first glance, the Bold Motion looks like your regular wearable - but rather than flipping between screens and apps, Movado has dialled things back in the name of simplicity (and artistic flair, naturally). It notifies of you of emails, updates and reminders by lighting up certain parts of the watch face - for instance, you can track your step by watching the outer edge of the watch illuminate. It might seem unintelligble to the untrained eye, but once you've got your head around Movado's way of thinking it's surprisingly simple to use. "Movado Group has always been committed to providing our consumers with exceptional innovative design and we are extremely excited to show the world how we have merged modern iconic design with technology," comments Efraim Grinberg, CEO and Chairman, Movado Group. "The partners we collaborated with execute smart technology in a user-friendly way understanding that today's consumers have differing needs regarding how connected they want to be." Created in collaboration with HP, the Bold Motion is said to provide up to a week's use on one charge and water resistance up to 50 metres - so clearly not having an app-filled screen on your phone has its benefits. 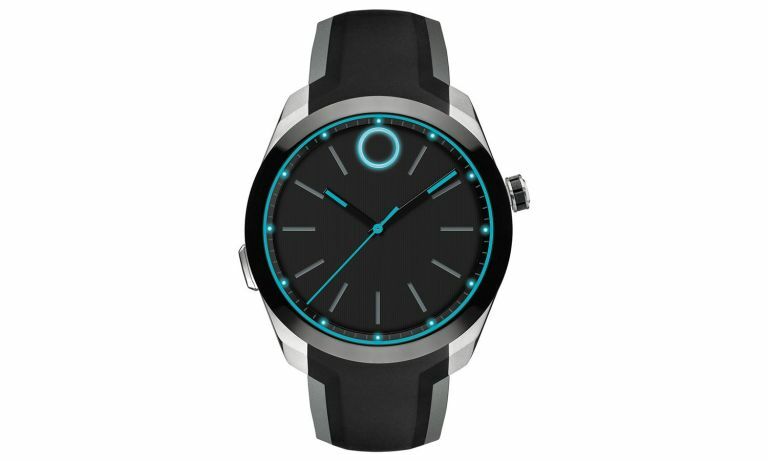 No news on when it'll be available, but Movado currently lists it at US$795 (that's roughly £520) so be sure keep your wrist (and your wallet) at the ready.